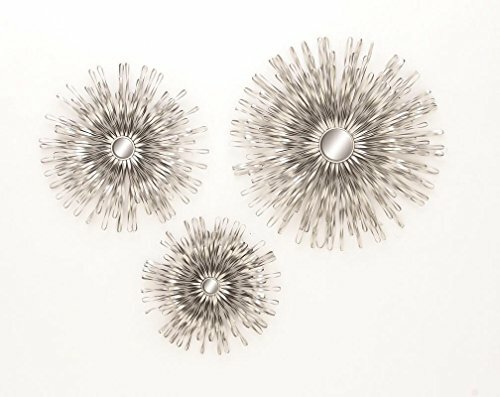 Deco 79 56884 Metal Wall Decor Mirror (Set of 3), 18"/22"/27"
B>description: designer wall decor for any modern or contemporary themed home interiors, there are three different sized decors in this set which will give a movement to your pale wall. These decors have distinctive design, these are round decors made from metal ribbons with beautiful mirrors in the center. Elegant silver hue which allows these wall decor to blend with any wall color scheme, these wall decors can be a part of your living space, bedroom, hallway, or any vacant wall in your home. Crafted with good quality material these wall decors ensure long lasting life. these wall decors are easy to mount and easy to maintain, dust them with a dry cloth at frequent intervals and nothing more. These wall decors are worth gifting, birthdays, anniversaries or house warming ceremonies these wall decors are perfect gifts for any occasion.